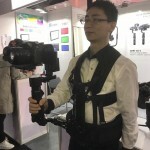 Do any of the CAME-TV gimbals have a Bluetooth Module? 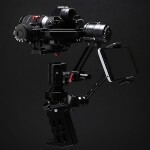 None of our gimbals currently come with a bluetooth module or support bluetooth connectivity with external mobile apps. Trying to install other third party modules into any CAME-TV gimbal may void your warranty. 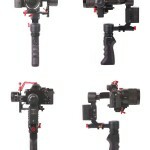 For wireless control of your CAME-TV gimbal, you can use the CSWR-4 wireless remote, which comes free and pre-paired with the following gimbals - CAME-Prodigy, CAME-Argo, CAME-Spry, CAME-Optimus, and CAME-Prophet. 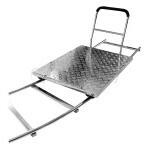 The CSWR-4 can also be used with the CAME-Single, but must be purchased as a separate accessory. Posted in CAME-7000, CAME-7500, CAME-7800, CAME-Mini, CAME-Single, FAQ on August 13, 2015 by CameAdmin. The SimpleBGC software does not see the connected gimbal. If you have connected your gimbal via USB, you may need to install the proper driver for your Mac or PC to communicate with the control board which can be found Here>>. 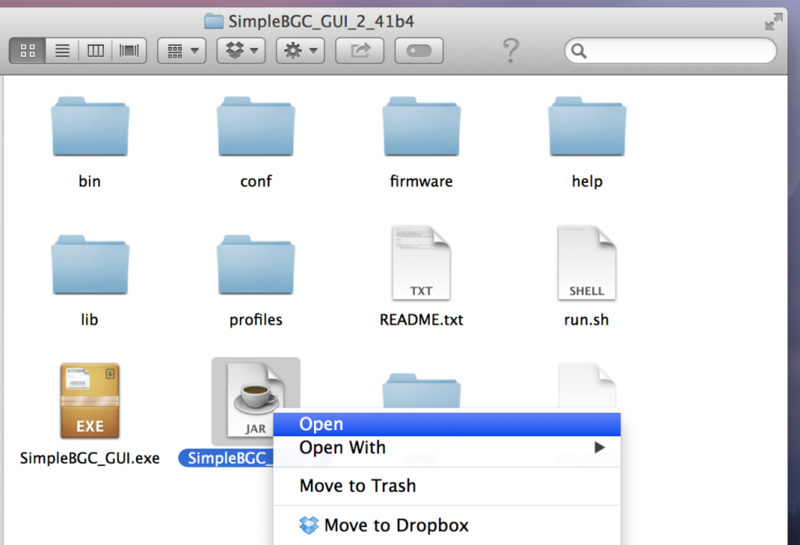 Once you have installed the proper Mac or PC driver and restarted your computer, connect the gimbal, go into the SimpleBGC software, and on the upper left, select the proper USB port, and hit 'Connect'. If you still do not see the gimbal or if you already have the proper drivers for your computer, please check your USB cable to make sure it is a Data cable. We suggest either testing the cable or just change the cable entirely to make sure it is not an issue. Make sure the cable is fully connected to the gimbal and your computer, then restart the SimpleSBC program. Posted in CAME-7000, CAME-7500, CAME-7800, CAME-Mini, CAME-Single, FAQ. 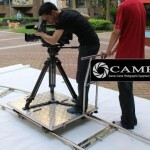 Tags: came-tv, cametv, connected gimbal issue, gimbal connection issue, gimbal issue, gimbal won't connect on July 31, 2015 by CameAdmin. Does the CAME-MINI or any other CAME-Gimbal have the motor encoders? Currently the only gimbal that has the motor encoders is the CAME-Single. We may start to implement these encoders onto newer versions of our gimbals in the future. Posted in CAME-7000, CAME-7500, CAME-7800, CAME-Mini, CAME-Single, FAQ. 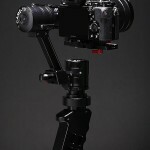 Tags: came gimbal, came-7000, came-7500, came-7800, came-mini, came-single, came-tv, cametv, encoders, motor encoders on July 31, 2015 by CameAdmin. 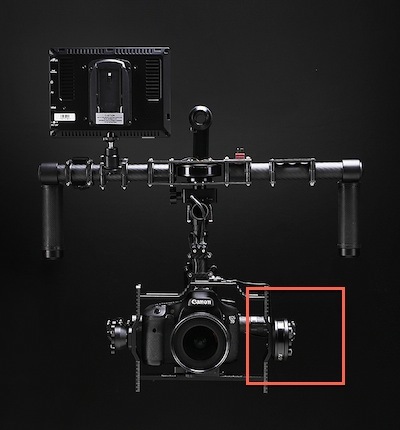 There are two sensors on the CAME-TV 7800 Gimbal. One is located above the camera frame, and the other on the vertical frame. These sensors will determine Right from Left as well as Top and Bottom. As your camera moves, the sensors will track the camera’s position. 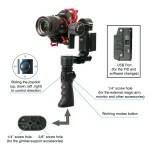 If the sensor is setup incorrectly the gimbal will be confused and cannot stabilize the camera properly. For the CAME-TV 7500 and 7800 Gimbal, setup the proper Sensor Orientation for both Camera IMU and Frame IMU. After making these changes, make sure to Save the Settings by clicking the WRITE Button on the lower right corner of the SimpleBGC Application. To verify that these settings are correctly tracking your camera's movement, first click on the CAMERA IMU Buttong. Now Tilt your camera up (lens towards sky), and tilt the camera down (lens towards floor). View the Pitch Scope on the right side of the application. The Arrow should follow the camera's movements and the point of the arrow should indicate the lens direction. You can verify the Roll of the camera by tilting the camera body 90 degrees on it's side. When standing behind the camera, the ROLL Scope on the right side of the Application should follow the camera's movements. If you are unsure about which settings to choose for your Sensor Positions, this video by MrCheesycam explains how to use the Auto Detect Mode. Posted in CAME-7500, CAME-7800, FAQ. Tags: calibrate, calibrate sensors, Camera IMU, dual imu sensors, frame IMU, gimbal frame sensors, Gimbal Sensor Auto Detection, gimbal sensor orientation, setup gimbal sensor, six point calibrate on July 30, 2015 by cametvblog. 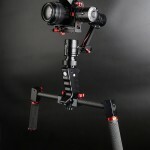 If you've received your gimbal, balanced your camera, and find the system works perfectly when panning Left or Right, but is not stable when Tilting Up or Down, double check if you've mounted the Camera Frame in the correct position. Take a look at the image below. The Pitch motor (controls Tilt) should be located on the Left Side of your Camera (when standing behind the camera). If you have the motor on the right hand side, then the frame is both upside down and backwards. This will cause confusion with the sensor orientation as it tries to keep your camera level. Surprisingly we receive several emails a week because of incorrect mounting of the camera. Most people will immediately start to change PID settings, and even attempt Firmware updates (not recommended unless you know what you're doing). 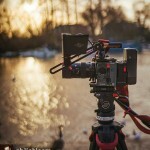 Please double check this before attempting to modify any settings on your gimbal. Install Camera Properly. Pitch Motor on Left Side of Camera. 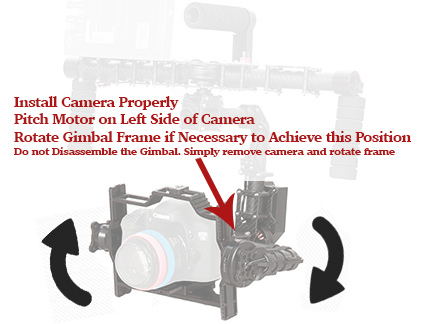 Rotate Gimbal Frame if Necessary to Achieve this Position. Do not Disassemble the Gimbal. Simply remove camera and rotate frame. 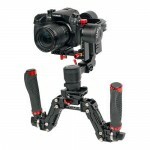 For tips on how to properly balance your gimbal, click here. Posted in CAME-7000, CAME-7500, CAME-7800, CAME-Mini, FAQ. Tags: Gimbal Balance, Gimbal Shaking, Tilt not Stable on July 30, 2015 by cametvblog. Connect to the Gimbal with a USB Cable and launch the SimpleBGC Software. For info about downloading and installing the software read this article. 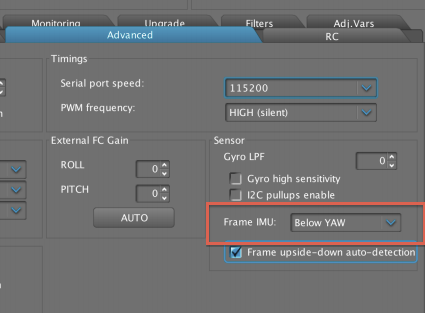 NOTE: The values above are shown as a sample only and may not pertain to your gimbal's unique RC settings. Do NOT copy them! 1.. The Joystick on the CAME-TV is a 2-Axis Joystick. This means it can control movements from either Pitch, Roll, and YAW. The default setting controls Pitch (tilt up | down) and Yaw (pan left | right). 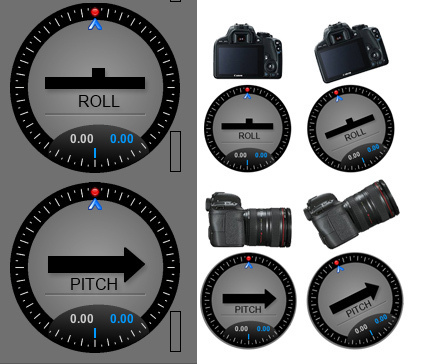 If you want to change these settings to control the ROLL of the camera, you can do this here. 2. The MIN ANGLE and MAX ANGLE is used to control the maximum allowed camera position when using the Joystick. The camera will automatically stop according to these angles. We recommend using -45 and +45 degrees. If you feel you want to control more or less camera angle through the Joystick, you can make the changes here. 3. Speed is how fast the camera movement is when the Joystick is used. A higher Value will cause the camera to move quickly when the Joystick is applied. A lower value will allow the camera to move slowly. If you want to change the speed of your camera movement when using the Joystick, you can make the changes here. 4. LPF is used to control the responsiveness of the Joystick controls. HIGHER LPF VALUE will delay the camera movements after the Joystick is applied. The camera will also take longer to come to a complete stop after Joystick. It will basically ‘ramp up speed’ during the start of camera movement and ‘ramp down speed’ at the end of camera movement. LOWER LPF VALUE will have immediate camera response. The camera will move immediately when the Joystick is applied, and will come to a sudden stop after Joystick application. This causes a ‘jerky motion’ which does not appear smooth, but is better for tracking very fast subjects. 5. INVERSE is used to change the direction of Joystick Controls. This is used because Joysticks can be mounted in different positions. If you move the Joystick Up and your Camera camera points down, you can change this with the Invert Option for Pitch (Tilt). After making this change, when you point your Joystick Up the Camera will point Up (instead of down). Joystick Left the camera Tilts Up, then you can swap these controls under the first setting (see Arrow 1). 6. The RC Sub-Trim is used to calibrate the Joystick. This is an electro-mechanical control surface that over time may need calibration for it’s true Neutral Position. 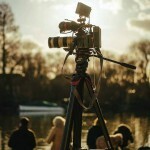 The most common problem is slow ‘drifting’ of camera position. When the Joystick is not calibrated properly, the gimbal believes that someone is applying Joystick commands and starts to move. To calibrate your Joystick, ensure that your Joystick is in it’s true neutral position. Make sure it’s not binding or stuck, and is centered as best possible. Then simply click on the Auto button and the values will automatically be entered. Or you can try to change these values manually to correct drift issues. Save the Settings by clicking the WRITE Button after you’ve made the changes. If you need additional information, this video by MrCheesycam explains more about the RC Tab and various settings. Posted in CAME-7000, CAME-7500, CAME-7800, CAME-Mini, CAME-Single, FAQ. 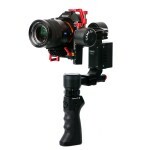 Tags: gimbal rc joystick, How to Adjust RC Settings, joystick speed on July 30, 2015 by cametvblog. If your Gimbal is Beeping more than 15 times and continues non-stop, this could be a Low Battery Warning. If the beeping stops after about 13-14 beeps, this could be a Calibration Process (see here). If the beeping does not stop, try to charge the battery for several hours and then try again. If you feel you have left your battery charging long enough and are still having continuous beeping, you may either have a bad battery (not holding correct voltage) or possibly a bad Battery Charger. Try another battery, or try another battery charger with your existing battery. Posted in CAME-7000, CAME-7500, CAME-7800, CAME-Mini, CAME-Single, FAQ. 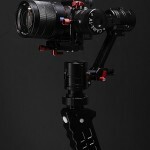 Tags: gimbal battery charger, gimbal beeping, low battery warning, non stop beeping alexmos on July 30, 2015 by cametvblog. If your gimbal beeps several several times (approximately 13 times) whenever you restart the system, this could be a Calibration Mode. If it continues to beep non-stop, this most likely is a Low Battery Warning (see here). When your Gimbal is going through a Calibration process it is important to have the entire gimbal level, hold the camera level, and also hold the gimbal frame square and centered. Once it is done calibrating, the gimbal should hold the camera position. If you allow the calibration to process while the gimbal or camera is not level, the calibration will be set to whatever position you allowed it to process. We suggest disabling this feature and to only perform Calibration Manually when needed. 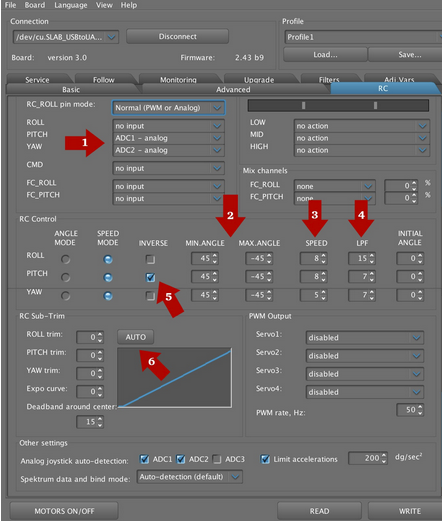 To disable the Calibration process each time you restart, connect to the software and select the option 'Skip Calibration on Startup' under the Basic Tab. Make sure to click on the Write Button to save your settings. Now each time you startup, the Gimbal will boot up immediately. Posted in CAME-7000, CAME-7500, CAME-7800, CAME-Mini, CAME-Single, FAQ, Uncategorized. Tags: gimbal beeping, gimbal beeps restart, gimbal beeps several times, gimbal calibrates on startup on July 30, 2015 by cametvblog. 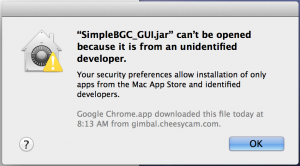 How Do I Download, Install, and Launch SimpleBGC Software on MAC OSX or Windows? IMPORTANT DISCLAIMER: Please know that all CAME-TV gimbals come pre-programmed to properly function and stabilize right out of the box without the need for software tuning. However, if you choose to make adjustments using the SimpleBGC software, you do so at your own risk. If or when you choose to do so, we strongly urge you NOT to make any changes that are not recommended by us. Doing so may affect your gimbal's functionality, and may require you to send it into one of our facilities for repair at your own cost (if still under warranty). Before making any of the suggested changes below, we also advise that you save your current profiles once connecting and/or capture screenshots of each tab & profile. And perhaps most importantly, NEVER UPGRADE YOUR FIRMWARE, even if the SimpleBGC software tells you to. AT-A-GLANCE CHECKLIST - What you'll need in order to successfully connect to the SimpleBGC software. In order to run the SimpleBGC software on a MAC OSX, you first need to download the MAC driver for the software which can be found by Clicking Here>>. For Windows computers, when you connect the gimbal to your computer, it may automatically install the proper drive. 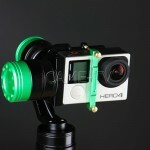 If the driver for the gimbal was not installed then you can find the driver by Clicking Here>>. Once you have downloaded & installed the driver, you then would need the SimpleBGC software that matches the firmware on your Control Board Here>> (If you are on Windows use the .exe file and for Mac use the .jar file). 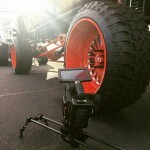 ARTICLE: HOW DO I KNOW WHICH SOFTWARE VERSION TO USE WITH MY GIMBAL? After you have downloaded and unzipped the software, you will see the following files below. 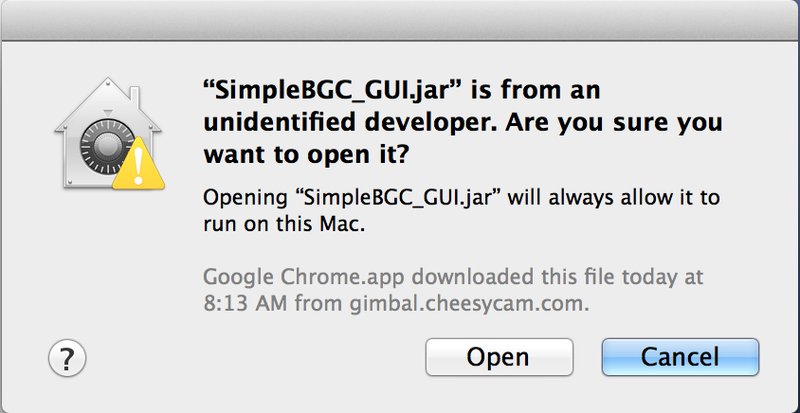 You need to make sure to launch the SimpleBGC_GUI.jar file on a MAC system. You may be prompted with a message saying that your system cannot open the file from an 'unidentified developer'. If that is the case, you would need to 'Control + Click' or 'right click' on the file and choose Open. WARNING: In the event that you receive an error message stating a "GUI Version Mismatch," this means that the software version you are attempting to use is not compatible with the firmware used to program your gimbal's board. No matter what, DO NOT UPGRADE THE FIRMWARE, even if the SimpleBGC software tells you to do so. Doing so will wipe your board's settings and prevent your gimbal from functioning normally. Click here for instructions on how to proceed if you are asked to upgrade your firmware. Shown above: When your gimbal's board (& associated firmware) conflicts with the SimpleBGC software that you are attempting to connect to. Click here for more information. 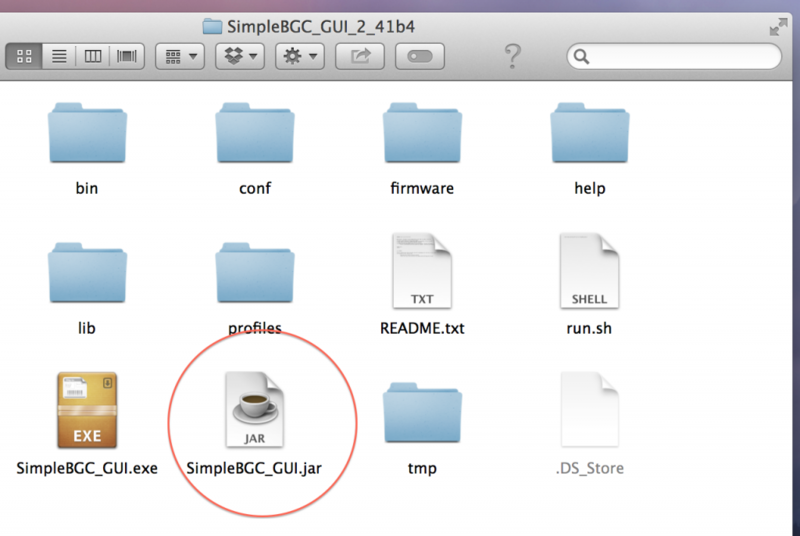 You should now see the SimpleBGC GUI software. Once the gimbal is securely connected via USB Data Cable, choose the appropriate port (usually the last one), and click connect on the top left. Please Note: If you are unable to connect the gimbal to the SimpleBGC software, please make sure your USB Cable is a Data Cable. Some USB cables are only used to charge devices and not a true Data USB Cable. Try swapping the USB Cable, reload the software, and try again. WARNING: We must again strongly urge that you do not suggest making any changes to software settings without direct guidance from a CAME-TV representative. Changing the wrong settings can cause malfunction to your gimbal's performance, and may cause the need to send it in for repair at your cost (if still under warranty). Typically, the connection port is the last one that is listed on drop down menu (and it is highlighted by default). Once you have it selected, click on the CONNECT button. Once you are connected, you will see values populate the screen. 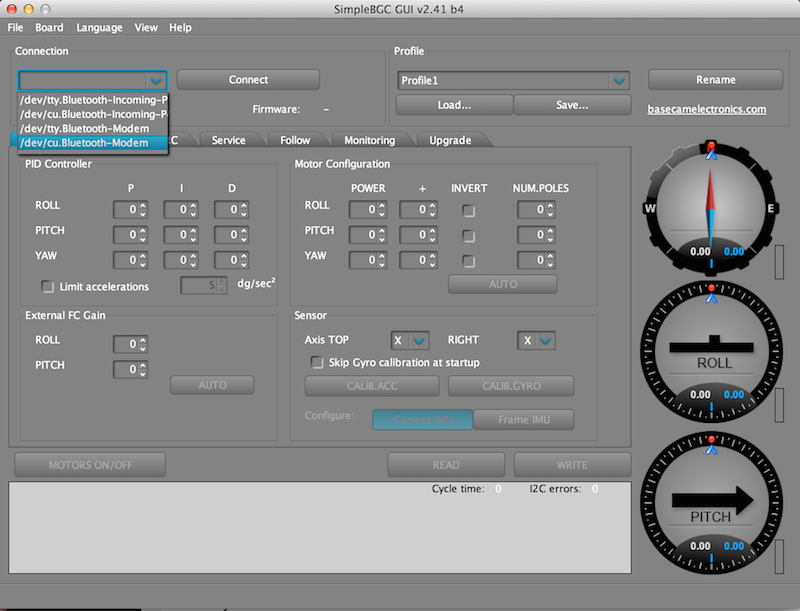 It is only after you successfully connect to the SimpleBGC software is it ok to turn on your gimbal. 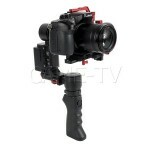 Turning on your gimbal may be necessary to do on-the-spot testing, such as adjusting motor power, or joystick speeds. 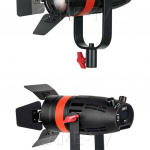 If you are connecting because of erratic behavior from your gimbal (shaking, spinning), you can always simply hit the MOTOR ON/OFF switch to temporarily deactivate the motors, but keep the gimbal powered up and connected. Once you have familiarized yourself with the software, and have made the necessary changes (ex: increased motor power), you can click on the WRITE button to save your settings. Once you have all the changes necessary and are ready to discontinue use, simply hit the DISCONNECT button on the top left of the screen. Once disconnected, you may remove cable from your gimbal and resume use. Posted in CAME-7000, CAME-7500, CAME-7800, CAME-Mini, FAQ on July 28, 2015 by cametvblog.